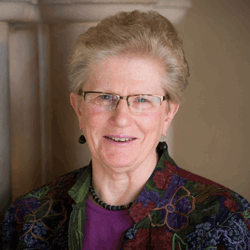 Mary C. Boys is the Vice-President of Academic Affairs and Dean at Union Theological Seminary, New York City; she is also the Skinner and McAlpin Professor of Practical Theology, and an adjunct faculty member of the Jewish Theological Seminary of America. Prior to her present appointment in 1994, she served for 17 years on the faculty of Boston College. A Seattle native, she has been a vowed members of the Sisters of the Holy Names since 1968. Boys received her master's and doctoral degrees from Columbia University in 1978 in a joint program with Union Theological Seminary. She has done advanced study at the Ecumenical Institute for Theological Research in Jerusalem, Israel, and is the recipient of honorary doctorates from Hebrew College-Jewish Institute of Religion (2004), The Catholic Theological Union (2007), The Jewish Theological Seminary of America (2011) and Gratz College (2012). She has been a Lilly Research Fellow and was a Henry Luce III Fellow in Theology for 2005. She was the was the recipient of the Ann O’Hara Graf award from the Catholic Theological Society of America. Prof. Boys is the author of six books: Biblical Interpretation in Religious Education (1980), Educating in Faith: Maps and Visions (1989), Jewish-Christian Dialogue: One Woman’s Experience (1997), Has God Only One Blessing? Judaism as a Source of Christian Self-Understanding (2000), Christians and Jews in Dialogue: Learning in the Presence of the Other (2006), co-authored with Sara S. Lee; and Redeeming our Sacred Story: The Death of Jesus and Relations between Jews and Christians (2013). Among her edited books are Seeing Judaism Anew: A Sacred Obligation of Christians (2005) and the co-edited volume Christ Jesus and the Jewish People Today (2011).